For artist duo Grégory Lasserre and Anaïs met den Ancxt, interaction in their artworks emerges from using multiple kinds of expression, mixing art and digital technology in order to find substances of dreams, poetries, sensitivities, and delicacies. Their works come from possible hybridizations between the living world and technology. They design interactive artworks and choreographed collective performances in which spectators share extraordinary sensory experiences. Their artworks are exhibited in museums, contemporary art centres, and digital art festivals across the world. 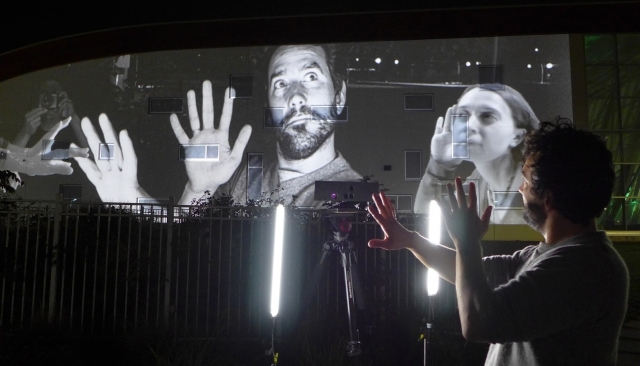 They have exhibited their interactive installation artworks at ZKM Karlsruhe Centre for Art and Media (Germany), Daejeon Museum of Art (Korea), Museum Art Gallery of Nova Scotia (Canada), National Centre for Contemporary Arts (Moscow), Contemporary Art Museum Raleigh (USA), and Bòlit Centre d’Art Contemporani (Girona). They have also presented these artworks in many international biennales and festivals: Art Center Nabi / INDAF (Seoul), BIACS3 / Biennial International of Contemporary Art of Seville (Spain), Biennial Experimenta (Australia), NAMOC / National Art Museum of China / TransLife / Triennial of Media Art (Beijing), Futuresonic (UK), WRO (Poland), FILE (São-Paulo), ISEA / International Symposium on Electronic Art (2009 Belfast, 2011 Istanbul, 2012 Albuquerque, 2013 Sydney), and EXIT, VIA, Lille3000, Ososphere, Scopitone, Seconde nature (France); during important events: World Expo (Shanghai), Nuits Blanches (Toronto, Halifax, Singapore, Brussels, Brighton, Amiens, Segovia, Bucharest), Fête des lumières (Lyon); and at various art centres: MONA (Australia), MUDAC, Fondation Claude Verdan (Lausanne), Musée Ianchelevici (Belgium), Kibla (Slovenia), Banff Centre (Canada), Villa Romana (Firenze), Utsikten Kunstsenter (Norway), Watermans (UK), and Centre des arts d’Enghien-les-Bains, Gaîté Lyrique (Paris).